When their transitions are self-determined, students are more committed to the process, take greater ownership for its outcomes, and adjust to their new situations in more personally meaningful and lasting ways. This important skill can be developed through a model for self-determination and five lessons. Although the transition process is ongoing from birth to death, individuals often experience some of the most frequent and intense transitions of their lives during adolescence. Adolescence, well recognized as a tumultuous life stage during which rapid change occurs, is marked by heightened self-awareness and independence, exploratory behavior (sometimes carrying high risks), increased ability to think abstractly and control impulses, and greater concern for vocational issues. In addition, many changes and transitions occur during this time as part of a student’s educational program (e.g., from middle school to high school, from residential or correctional facilities to community settings, from high school to postsecondary training or employment). To successfully negotiate these transitions and deal with the shifting demands of daily life, adolescent students need to be equipped with a variety of functional life skills (Clark, Field, Patton, Brolin and Sitlington, 1994). One of the most crucial of these is self-determination. The first two components describe the internal awareness and strengths that are prerequisites for acting in a self-determined manner. The next two components, Plan and Act, identify skills required to build on this internal foundation. The final step, Experience Outcomes and Learn, includes both celebrating successes and evaluating one’s efforts in self-determination in order to enhance one’s skills. Why is self-determination so important? The crucial importance of self-determination is highlighted by the research on motivation. This research consistently shows that students are more motivated to perform school tasks they have participated in choosing (Kohn, 1993; Perlmutter and Monty,1977; Wang and Stiles, 1976; Reason, Favell, and Lowette, 1990; Schunk, 1985; Wehmeyer, 1992). Similarly, when their transitions are self-determined, students are more committed to the process, take greater ownership for its outcomes, and adjust to new situations in more personally meaningful and lasting ways. Although developing self-determination can be difficult for all adolescents, it is made more so for those with emotional and/or behavioral disorders that often magnify typical adolescent developmental challenges (e.g., risk-taking behavior, increased independence). Cullinen and Epstein (1994) identified six such major behavior patterns associated with behavioral disorders: (1) aggression-disruption, (2) hyperactivity, (3) social maladjustment, (4) anxiety-inferiority, (5) social incompetence, and (6) learning disorders. These behavior patterns can directly affect the knowledge and skills needed for self-determination identified in the figure. For example, anxietyinferiority has a negative impact on the Know and Value Yourself components of self-determination. Aggression-disruption, social maladjustment, and social incompetence all affect students” abilities to demonstrate skills in the Action components of the model (e.g., communication skills, negotiation skills, conflict resolution). Clearly, special attention is required to ensure that youth with behavioral and/or emotional disorders can overcome these challenges to learn and practice the skills of self-determination. Two federally funded transition projects provide examples of how schools can implement interventions for at-risk youth that enhance and capitalize on self-determination. 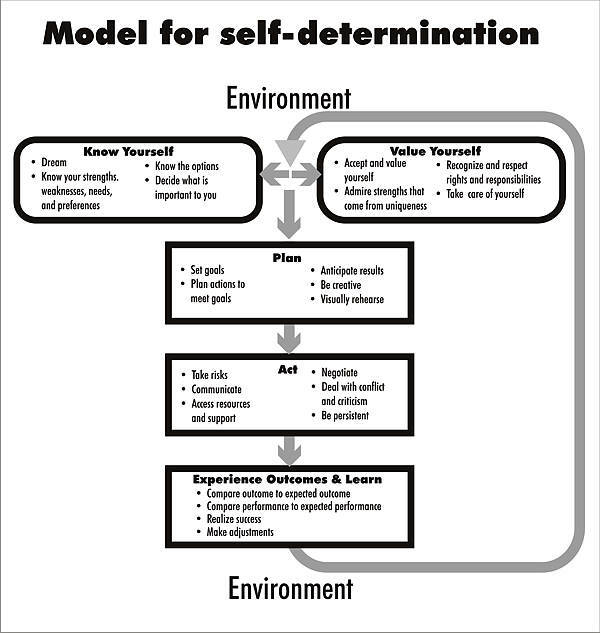 The model of self-determination developed by Field and Hoffman (1994) described above provides the foundation for both efforts. The second project, a Self-Determined School Improvement model, was designed to assist at-risk youth as they make changes in their educational settings. In this model, a collaborative school improvement team develops recruitment strategies, curriculum, instructional strategies, individual planning procedures, and supports that all meet the needs of at-risk youth in developing self-determination. Resources developed by this team’s interactive process are then available to teams that focus on individual students. Reciprocally, new issues and solutions identified in individualized planning inform and provide resources for the school improvement process. Thus, self-determination is reinforced at both the individual and the programmatic levels. Teach the specific knowledge and skills needed for self-determination. Just as educators need to teach specific developmental skills in reading, math, and social studies, so too do they need to teach the specific developmental skills and knowledge that help students become more self-determined. As a result of several research and demonstration projects recently funded by the U.S. Department of Education and the Office of Special Education and Rehabilitative Services, many curricular materials and instructional strategies have been developed to help educators teach these skills. Some programs are targeted specifically toward helping students participate more fully in transition planning meetings, while other curricula approach self-determination from a broader perspective. * Several programs are even available that address the specific skills students need to lead their educational planning meetings (Halpern et al., 1997; Martin, Marshall, Maxson, Jerman and Miller, 1996; VanReusen, Bos, Schumaker and Deshler, 1994; McGahee-Kovac, 1995; Wehmeyer and Kelchner, 1995). In addition, many materials and teacher-developed interventions target specific components of self-determination (e.g., decision making, communication skills). A solid instructional program to build self-determination can be developed by pulling from many such sources to assure that all key component skills are addressed. Provide ample opportunities to apply and practice self-determination skills in educational environments. If we expect students to acquire and maintain skills in self-determination, it is important that educational environments provide ample opportunities for student choice and decision making. The transition planning process is one excellent forum for the application and practice of self-determination skills. As students, teachers, and parents are planning together for transitions in students” educational programs, student-centered decision making helps assure a more successful plan by increasing student ownership of the plan. However, a safety net should be ready and waiting to help in recovery if a student makes a decision that later turns out to be a mistake. For example, if a student chooses a certain type of job experience and later finds that he or she does not have the skills to successfully perform the job tasks, the student should be able to try a different type of experience. Help youth develop positive, supportive relationships with caring adults. Abundant research supports the importance of a caring adult mentor in helping youth successfully navigate the turbulent adolescent period. Our work with at-risk youth in a variety of settings has confirmed the importance of these relationships in developing self-determination. When we conducted interviews with students and adults, with and without disabilities, we asked them to identify what helped or hindered their ability to be self-determined. The answer given most frequently to both questions was “a family member, teacher, mentor, or friend” (Field, Hoffman and Sawilowsky, 1997). Likewise, when we asked youth about their goals and how they became determined enough to achieve them, we most often heard that their primary motivation came from an adult who listened to, understood, supported, encouraged, and believed in them. Provide a predictable environment. To be self-determined, students need to be able to predict the potential consequences of their actions with some degree of accuracy. In chaotic environments where predicting such outcomes is difficult, it can be exceedingly difficult for students to make decisions about what actions will help or hurt them in meeting their goals. Therefore, management strategies which result in orderly, predictable classroom environments can greatly enhance students” opportunities to be self-determined. Model self-determination. We learn as much, if not more, from what is modeled by others in our environment as we do from what is explicity taught in a curriculum. Teachers and administrators can model self-determination for students. Just as important, they can base their policy decisions regarding issues such as what choices students are allowed to make and what curricula will be offered on a true commitment to active involvement and self-determination throughout the organization by students, parents, teachers, support staff, and administrators. However, even if such a commitment is not present at top administrative levels, creative staff, through their own self-determination, can do much to assist at-risk youth in transition to learn and exercise self-determination. Change is a constant throughout our lives which necessitates transition, and self-determination skills need to be specifically taught and nurtured to help youth successfully navigate the process. Curricular offerings, instructional planning, course strategies, environmental conditions, and administrative arrangements all affect the development and expression of self-determination by at-risk youth. Helping them build this essential “ability to identify and achieve goals based on a foundation of knowing and valuing oneself” not only helps to ensure successful transitions during adolescence, but also provides them with a crucial skill for their continued success as they journey into adulthood. Bridges, W. (1980). Making sense of life’s transitions. Reading, MA: Addison-Wesley. Clark, G. M., Field, S., Patton, J. R., Brolin, D. E. and Sitlington, P. L. (1994). Life skills instruction: A necessary component for all students with disabilities. Career Development for Exceptional Individuals, 17, 2. pp. 125-133. Cullinen, D. and Epstein, M. H. (1994). Behavior disorders. In N. Haring, L. McCormick and T. Haring (Eds. ), Exceptional children and youth, sixth edition (pp. 526-555). Columbus, OH: Macmillan. Field, S. and Hoffman, A. (1996). Steps to self-determination. Austin, TX: Pro-Ed. Field, S., Hoffman, A. and Posch, M. (1997). Self-determination during adolescence: A developmental perspective. Remedial and Special Education, 18. pp. 285-293. Field, S., Hoffman, A. and Sawilowsky, S. (1997). Research in self-determination: Final report. Detroit, MI: Wayne State University. Field, S., Martin, J., Miller, R., Ward, M. and Wehmeyer, M. (1998). A practical guide for teaching self-determination. Reston, VA: Council for Exceptional Children. Halpern, A. S., Herr, C. M., Wolf, N. K., Lawson, J. E., Doren, B. and Johnson, M. C. (1997). Next S.T.E.P: Student transition and educational planning. Austin, TX: Pro-Ed. Hoffman, A. and Field, S. (1995). Promoting self-determination through effective curriculum development. Intervention in School and Clinic, 30, 3. pp. 134-141. Kohn, A. (September, 1993). Choices for children: Why and how to let students decide. Phi Delta Kappan. pp. 8-20. Levinson, D. J. (1978). The seasons of a man's life. New York: Knopf. Martin, J. E., Huber Marshall, L., Maxson, L., Jerman, P. and Miller, T. L. (1996). The self-directed IEP. Longmont, CO: Sopris West. McGahee-Kovac, M. (1995). A student’s guide to the IEP. Washington, DC: National Information Center for Children and Youth with Disabilities. Perlmutter, L. C. and Monty, R. A. (1977). The importance of perceived control. Fact or fantasy? American Scientist, 65. pp. 759-765. Reason, R. E., Favell, J. E. and Lowette, A. (1990). The effects of making choices on engagement levels with persons who are profoundly mentally handicapped. Education and Training in Mental Retardation, 25. pp. 248-254. Schlossberg, N. K. (1991). Counseling adults in transition. New York: Springer. Schunk, D. H. (1985). Participation in goal setting: Effects on self-efficacy and skills of learning disabled children. The Journal of Special Education, 19. pp. 307-316. VanReusen, A. K., Bos, C. S., Schumaker, J. B. and Deshler, D. D. (1994). The self-advocacy strategy. Lawrence, KS: Edge. Wang, M. C. and Stiles, B. (1976). An investigation of children's concept of self-responsibility for their learning. American Educational Research Journal, 13. pp. 759-179. Wehmeyer, M. L. (1992). Self-determination and the education of students with mental retardation. Education and Training in Mental Retardation, 27. pp. 302-314. Wehmeyer, M. L. and Kelchner, K. (1995). Whose future is it anyway? Arlington, TX: National Association for Retarded Citizens. This feature: Field, S. and Hoffman, A. (1998). Self-determination: An essential element of successful transitions. Reaching Today’s Youth, 2, 4. pp. 37-40.